Last week, I wrote about some of the new technologies brought forth in the Internet of Things revolution. A new technology that has developed into its own genre during the past couple of years is smart beacon technology. The way that a smart beacon works is simple: It sends out a signal, which is picked up by your smart device (phone, tablet, etc.) through an app, and then the devices can communicate via the beacon. Of all the Internet of Things capabilities, beacons are one of the uses that are bound to see massive commercial growth within the next year or two. 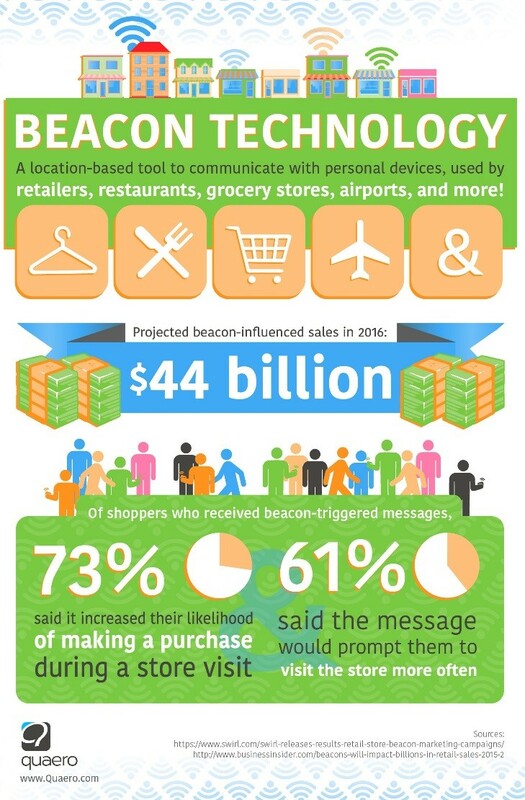 It’s estimated that 400 million beacons will be in use in retail stores by 2020. Companies have already started using beacons to promote items that are on sale. For example, let’s say you are in Target and there is a sale on watches. If you have an app that connects to the beacon, you will get a message on your phone when you’re near the watches that tells you about the sale. Another way that beacons can enhance one’s shopping experience is by giving suggestions on what to buy. For example, the beacons in the store will “see” which items you have selected on the company’s app. They can not only give suggestions on what else you might like, but tell you exactly where in the store you can find those items. The beacons can even plot a route to that location from your current position. Smart beacons have also found success in classroom settings. As technology has become a priority in classrooms, more teachers are using devices such as tablets to assist with their curriculum. In fact, over 60% of students in 2016 said their instructors use technology, such as laptops, tablets and smartphone apps, to communicate with students. This makes lessons more engaging, which can help students focus better in class and retain more material. As a result of the evolution of technology in the classroom, smart beacons now have several relevant uses for student-teacher interaction. For example, students can work in groups and share their documents with one another without needing a code or email address. Similarly, teachers can share classroom material such as PowerPoints and videos with all of the other devices in the classroom. Another way that beacons could work in the classroom is with interactive activities such as study games, quizzes and polls. Of course, this technology is still in its early stages. As it becomes more widespread, you can expect to see a variety of innovative uses for it.